Growing horseradish on your homestead offers several benefits. First, it is a perennial, which means it only needs to be planted once. Second, horseradish is a terrific companion plant for your fruit trees, as it acts as a natural pest repellent. Finally, horseradish is a niche crop that, if marketed correctly, can command premium prices. Because horseradish is a perennial, it is important to be certain of its placement before you plant it. If you have fruit trees on your homestead, horseradish can be planted in the orchard to protect your fruit trees from pests. 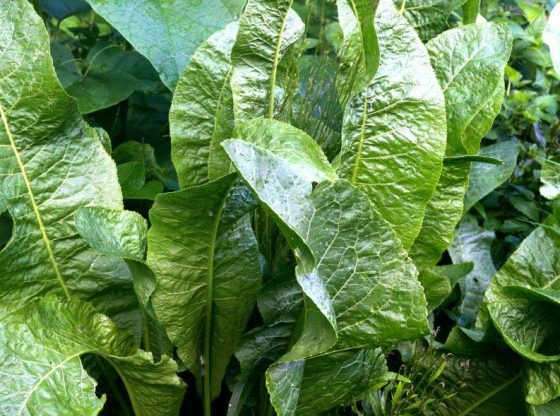 Because horseradish is not only perennial but a rapidly spreading plant, you may want to contain this crop by planting it in bottomless, buried planters. Horseradish is a hardy crop which can be grown in all types of soil. It likes sun but can still grow well in partial shade. The only thing this plant does not tolerate is soggy roots, so make certain the site you choose has well-draining soil. If that is a problem, plant horseradish on hills or in raised beds. 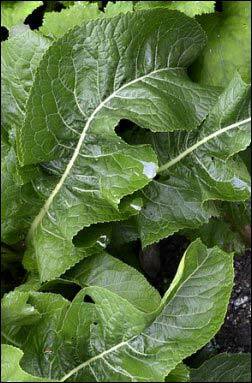 Horseradish should also be planted at least 18” from other garden plants. If you live in a warm zone and do not experience extended hard frosts, you can plant horseradish in the fall. Otherwise, it is your best bet to plant in the spring. Horseradish needs one full year before harvesting. When you have chosen a location, begin by digging a hole for each tuber that is 1′ deep. Make each hole wide enough to accommodate the entire length of the root. Place the root in the hole at an angle, with the thinner portion pointed downwards. Add a scoop of compost and cover with garden soil. Horseradish needs to be watered once a week during the growing season, twice a week if the weather becomes extremely hot and dry. 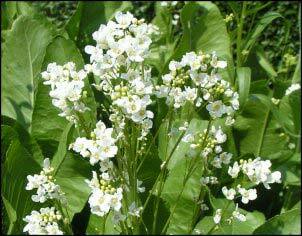 Horseradish will grow up to three feet and produce white, surprisingly sweet-smelling flowers. Take care to prune away any suckers growing off the main plant and remove any flowers to ensure all the energy is being directed to the root. You can harvest your entire crop of horseradish at one time in late fall, or you can harvest what you need and store the rest in the ground. You can continue harvesting through early spring, but you do want to harvest all of it before the first hard frost, as a hard frost can cause your tubers to rot. Use a digging fork to loosen the soil in a wide circle around each plant. When you can determine the direction in which the root is growing, gently dig it out with your hands. There are a few options for storing horseradish. If you are planning on using it within a few weeks you can wash, dry and store it whole in an airtight container in the refrigerator. To store for personal use for up to a few months, grate clean horseradish and cover with vinegar. Store in the refrigerator. Use ¼ cup for every cup of prepared horseradish. You can also store the whole root, ends trimmed, in a jar of apple cider vinegar or white wine vinegar. The root can be grated later and you can use the vinegar for marinades or salad dressings. If you are selling whole horseradish, you can store the root indefinitely. Fill a box ¾ full with clean, dry sand. Stick the root, small side down, in the sand. Cover the entire root with more sand and store in a cool, dry and dark place. Any pieces of the root that you do not harvest, will come up next year. You can let this happen at will or you can be more intentional about your planting. If you find you enjoy growing horseradish, it is easy to expand your horseradish plot. Simply replant some of your healthiest roots, making sure they are in well-drained soil and are at least 18” from other garden plants. Do this as soon after harvest as possible to ensure the roots get enough growing time to make next year’s harvest. It may seem that because horseradish is such a niche crop that you are limited in your marketing choices. That would be untrue. In fact, because it is a niche product, you might be the first farmer in your area to offer it. If you have grown enough, consider marketing it to local restaurants and specialty grocers. The restaurants that are most likely to purchase horseradish are those that sell fried fish as well as those that sell roast beef. Make sure you have grown enough product to fill their need. Once you get your foot in the door at a local restaurant or grocer, selling your other farm produce becomes much easier. When it comes to selling at your market booth or farmstead website, the keys to sales are information and choices. In addition to the whole root, offer horseradish powder, horseradish vinegar, and prepared horseradish sauce, both mild and hot. Recipe cards are always a good idea – sometimes people want to buy but have no idea how they can use the product. Make it easy for them. Next to your horseradish products, offer a medicinal product or two made with this versatile root. Be sure to include a card noting the medicinal benefits as well as how to use the product. Horseradish is used medicinally to aid in weight loss, lower blood pressure, alleviate respiratory and sinus conditions, improve the immune system, stimulate healthy digestion and help prevent cancer. The following recipes and techniques can help you begin producing a marketable product from your fresh horseradish. Drying horseradish to make powder is very simple. You do want to make sure you are in a well-ventilated space since it can have a pungent odor that may irritate your eyes. Another option is to first freeze the root before grating. This will drastically decrease the irritating aroma. Horseradish powder can be added to spice blends, used in sauces and dressings, or as a dry rub for beef. Scrub the root and rinse under cold running water. Trim the top off and grate the entire root. Spread out on dehydrator trays or in a single layer on a baking sheet lined with parchment paper. Set the temperature to 150 degrees Fahrenheit and cook at this temperature for one hour. Lower the temperature to 130 degrees Fahrenheit and continue cooking until brittle, approximately five to nine hours. If your oven doesn’t go down that low, put it on the lowest temperature and prop the door open. Once the horseradish is completely dry, let it cool to room temperature and grind to a powder in a blender or food processor. Transfer to airtight containers. Four-ounce canning jars work perfectly. 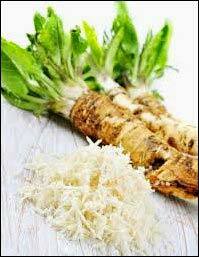 To make prepared horseradish simply cover grated horseradish with vinegar. The spicy bite of horseradish comes from the isothiocyanate compound. The heat and aroma are almost completely absent until it is sliced or grated because those properties are generated when oxidized by air and saliva. This means you can control the heat of your product. The sooner you cover the grated root with vinegar, the milder your finished product will be. If you are selling prepared vinegar in canning jars, lay a piece of waxed paper over the jar opening before placing the lid. Vinegar is corrosive and will rust your lids. To make horseradish vinegar to sell, begin as if you are storing horseradish in vinegar. Once the vinegar has soaked in vinegar for 4-6 weeks, remove the root. Sterilize your vinegar bottles. Grate the horseradish and add ¼ cup to each bottle. Add 1/8 cup of fresh dill or a sprig or two of fresh rosemary. Toss in some peppercorns. Cover with the vinegar you soaked the root in and cork. Stick a pretty label on your bottle and you are ready for the market. Don’t forget to use horseradish in your own kitchen. This flavor compliments potatoes, peas, beets, broccoli, and leeks, so it makes a great addition to creamy soups and hearty casseroles. You can also add some grated horseradish to sour cream for a baked potato topping, as an accompaniment to cold meat slices or as a delicious condiment on roast beef sandwiches. When you use horseradish in your cooking, add it towards the end of your cooking time. Otherwise, you will lose most of the flavor, heat, and benefits of this ingredient. Horseradish can be a terrific addition to your homestead. As an alternative crop, it can’t be beat. It offers multiple marketing opportunities, is a hardy, easy-to-grow perennial and acts as a natural pest repellent in your orchard, as well as being a delicious ingredient in your own kitchen. Don’t worry if you are the only one growing this crop in your area. Homesteaders are not known for following the crowd, and we are usually ahead of the trend!